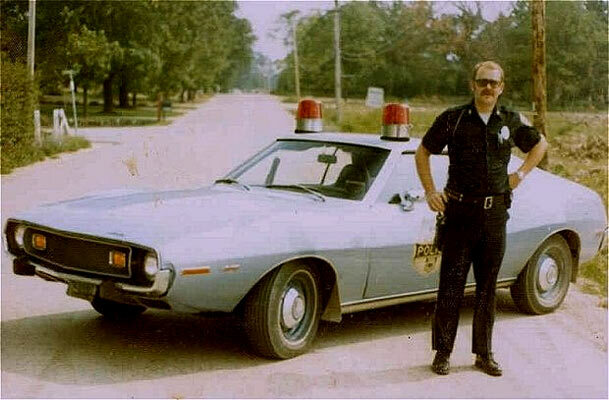 This readers rides submission by Brian Raby highlights how a cop car can be one of the coolest on the road. Back in 1971, the AMC Javelin SST was an ideal hot pursuit vehicle and what blended into the car landscape of the time, with a gap of 40+ years, it now looks like one of the coolest cars on the road. If you were stopped these days by a cop in an AMC Javelin SST, you would definitely stop just to check out his ride! In 1971, the Alabama Highway Patrol became the first police organization in the United States to use down-sized vehicles for regular highway patrol duties. This pre-dated, among others, the Camaros and Mustangs that were used by other departments years later. The AMC Javelins were the first pony cars used as police cars by any U.S. organization. The Alabama Highway Patrol evaluated two versions supplied by a local dealer: a 1971 AMC Javelin SST with a 304 cu in (5.0 L) V8 and a 1971 Javelin-AMX with a 401 cu in (6.6 L) V8 engine. After this trial, the first order was for base model Javelins with heavy-duty “fleet” equipment, “Machine” wheels with Good Year Polyglass raised-white-lettered tires, and a rear spoiler (normally available only on a Javelin AMX model) to display the “State Trooper” markings on the rear of each car. A total of 132 AMC Javelins were purchased during 1971 and 1972. The Javelins came with 401 cu in (6.6 L) 335 horsepower (250 kW; 340 PS) AMC V8 engines. The last of the AMC Javelins was retired in 1979, and one of the original cars is now part of the Museum at DPS Headquarters.